When the figures of a vintage first aid book meet the monsters of a medieval bestiary. A series of drawings. Drawings for a new alphabet. An astronaut dog lost in space, woman lost in the mirror. Two ten minute plays were presented as staged readings in the Off The Mapp Festival in 2012. A sidewalk sale, an empty chair, and how it ended this way. Radio play for solo female voice. Two lonely typewriters meet in an interrogation room, each with a distinctive voice and something to hide. This is part of the Plays for Inanimate Objects series. A meditation on loss, a ritual of expiation, and a musical send-off. Using Butoh dance, a ukulele concert at Grant’s Tomb, humor, a live peacock and an ex-boyfriend's old t-shirt, I performed a series of short dance pieces at different sites in upper Manhattan that became a video piece. Memory suffers erasure through repetition, just as the joints of the body and worn down by injury. The metaphor of Brazil is used throughout, as an emblem. The shape of the country is traced again and again in chalk by a blindfolded dancer, becoming more and more unrecognizable to the sounds of the bossa nova. The T-shirt is venerated, worshiped, destroyed, and even consumed. An impossible white peacock joins the dance but is forever just out of reach. Pieces of the True T-shirt mimics the language of relics to ask: What are your icons? And if you profane them, do they become stronger, or do you? What does a monument to impermanence look like? How do you say goodbye to parts of yourself? What should be done with an ex-boyfriend's t-shirt? What gets worn away through repetition? With the music of Antonio-Carlos Jobim played and sung by Doug Skinner and Carmen Borgia, and joined by dancers Qxi O. Qxa, and Nell Mellon, the video includes the velvet voice of Ricardo Aureliano Alcaraz as The Voice of Your Heart and extra text by Stendal. The video was presented as part of Chashama's Artist in Residence program in August 2008. The Wall Street Bull is a friend of mine. It didn't start out that way. Initially I offered myself as a sacrifice, Dressed as a kitsch, Cecil B. Demille notion of a virgin sacrifice to the bronze statue of dynamism, force and a market economy gone amok, I presented the bull with flowers and prostrated myself between its massive front hooves at dawn on four different days in 2007 and 2008. When traders arrived for work, they were horrified. One even ran across the street shouting at me. "Love the bull," he commanded, "he's good luck!" Then he rubbed the bull's bronze testicles and went off to work. And as the work days began, busloads of tourists came, each wanting to touch the bull and take photographs. Some were annoyed that I had taken up the coveted spot between his paws, and complained in different languages that I ruined their dream vacation photo. But others joined me there in what became a pagan veneration of luck, money, and change, and yes, even the market. Using the conventions of a product launch (free product samples, audio and video commercials), along with dance and a recorded text “Sovereignty” parodies the way in which advertising has commandeered the language of feminism. “Sovereignty” explores the following questions: What oppressive labor conditions are used to create luxury goods? What is the relationship between producers and consumers? What does it mean to fall in love with a product? Why do we construct our identities with products? Is anyone really independent? 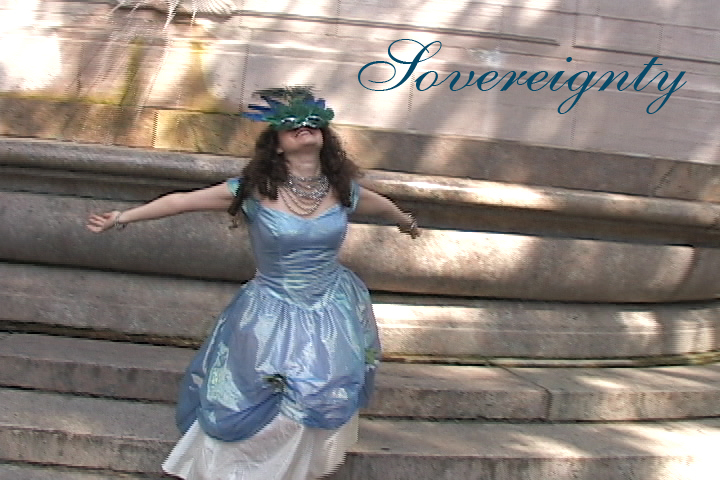 Sovereignty was performed at Chashama’s Oasis Festival in 2007 and at New Dance Alliance’s Performance Mix in 2008. Audience members were given perfume samples, and the perfume sales girls were played by Qxi O. Qxa and Aditi Dhruv (Oasis) and Nirali Shastri and Ileana Pinon (NDA). The voice talents of Bobbi Leann Williams, John-Paul Skocik, Pauline Park, Carl Hsu, Yonatan Yudekovitz, Manassa Hany and Mario Hernandez were also featured. This piece was made possible by a grant from the Puffin Foundation. On June 26th 1998, I declared my physical body a sovereign nation. I did so by fiat, which is the origin of the motto of those early years, Ipsa Dixit (she said it herself), and became Mykronesia. As an independent country, I faced many challenges. I struggled, unsuccessfully, to attain U.N. member nation status. I entered into predatory loans with the IMF. And I found myself in the middle of a terrible civil war with myself which brought me to the International Criminal Court at The Hague where I was tried for atrocities and war crimes against myself. I also created 3 full-length theater shows about one-person-nationhood, two of which were produced in the New York Fringe Festival and one at the Where Eagles Dare Winter Festival. In 2005, I shared a double bill in the NY Fringe Festival with Mita Ghosal in a work called Head Over Heels and Away. Political turmoil aside, I also created a culture, complete with native ethnic folk costumes (mostly polyester), native folk-dances, a language (Kronish), and a religion devoted to the cathartic worship of Faye Dunaway. I shared my culture in countless variety shows and cabarets, including my own variety show, Vaudeville Utopia, where I taught some of my language and native dances to foreigners. I also minted money: the heavily inflated Kronicle. I pegged it to the Romanian Leu, since Romania seemed to have the same problems of high unemployment and out of control inflation. Kronicles were minted whenever I needed cash and were given away to tourists at performances. 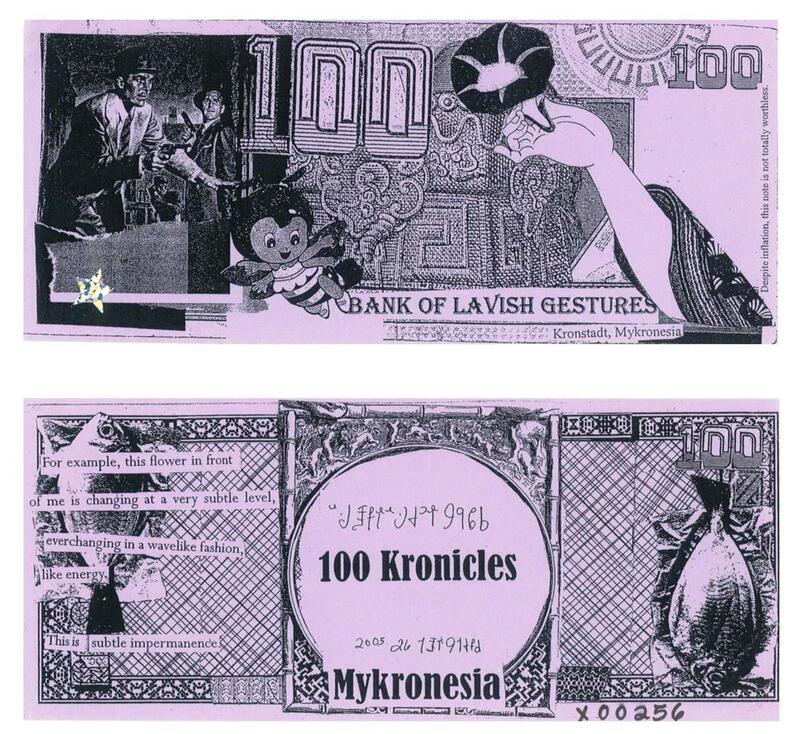 The Kronicles were photocopied collages with serial numbers. 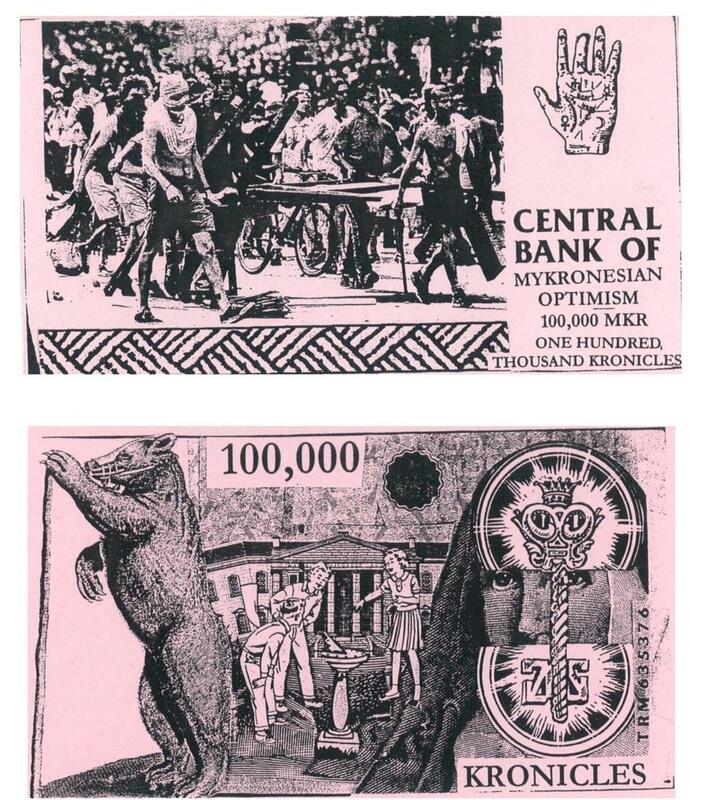 Of course photocopying more money whenever I needed it led to even higher inflation. While I am still a sovereign nation, I no longer have a tourist industry. I have chosen to work on rebuilding my economy, finding new green energy sources, and perfecting my native ethnic handicrafts such as latch hook rugs. The last performance of my native ethnic folk dances was on July 26th, 2008 as I celebrated my independence day and ten years of statehood. My current motto is "Estoy Como Nunca" (I'm Better Than Ever). All Images and text © 2017 Kron Vollmer. All Rights Reserved.